RIP OFF is the third book to feature fifth generation Chinese-Australian policeman Brad Chen. As the novel opens Chen is due to return to his job with the Australian Federal Police (AFP) after being on extended leave but he is called into service a few days early when a bizarre series of killings occurs across the country. In Perth then Adelaide several people are murdered in a similar fashion and their connection seems to be the fact that they had something to do with a large-scale financial fraud which left many ‘mum and dad’ investors penniless. Chen, his colleagues in the AFP and the various state-based liaison officers assigned to the case begin the task of capturing the killer (or killers) but they seem to be behind the eight ball, especially when the public are on the side of the killer. In the opening pages of RIP OFF there’s a scene in which an opinionated taxi driver gives Chen the benefit of his brand of bigoted and ignorant wisdom. Having a job that sometimes elicits the exact same kind of “if only you’d listen to me there’d be no more criminals/health care blowouts/illegal immigrants…” diatribes from taxi drivers I immediately felt at home with this book. The fact that Chen has several more increasingly surreal encounters with this peculiar subset of humanity was just one of the many sources of amusement in this delightfully witty book. Indeed the entire thing is an homage to wordplay of the best kind, offering a feast of clever nicknames, wry observations and fast, funny dialogue. Even if it had nothing else the language alone would be worth reading this book for. Happily there’s a cracker of a tale as well, though it does play fast and loose with the conventions of the genre. There’s not a lot of bloody violence and virtually no forensics or CSI-inspired gadgetry or pseudo-science. Chen, who is distanced a little from the heart of the investigation, is an old-fashioned type of policeman who makes observations, plays his hunches and talks to people. This doesn’t always work out well but it has the kind of authentic air about it that TV crime shows rarely do and it gets the job done eventually. Along the way there are the inevitable clashes of the jurisdictional kind and these are completely realistic, happening I’m sure in every profession and in every corner of the globe. Robertson has really nailed the setting of this novel both in terms of its physical locations (he does a particularly nice job depicting my home town for the first half of the book) and its social observations. I’m not sure what would happen in other parts of the world but I’m fairly confident that if someone did start murdering the kinds of financial players depicted here most Aussies would behave in the way they are depicted here. I now consider myself to have been very lax in not reading the first two books of this series but at least one of them is lingering in my TBR pile and I’m now looking forward to it immensely. I now know just enough about Brad Chen to want to go back and learn about his earlier cases which is always a good sign. As well as being a wholly believable character he’s also an interesting mix of traits, having played footy at the highest level and now completing his PhD thesis and being one of the most dedicated house cleaners I’ve ever read about. I love the way Robertson depicts Chen dealing with the racism he encounters too. 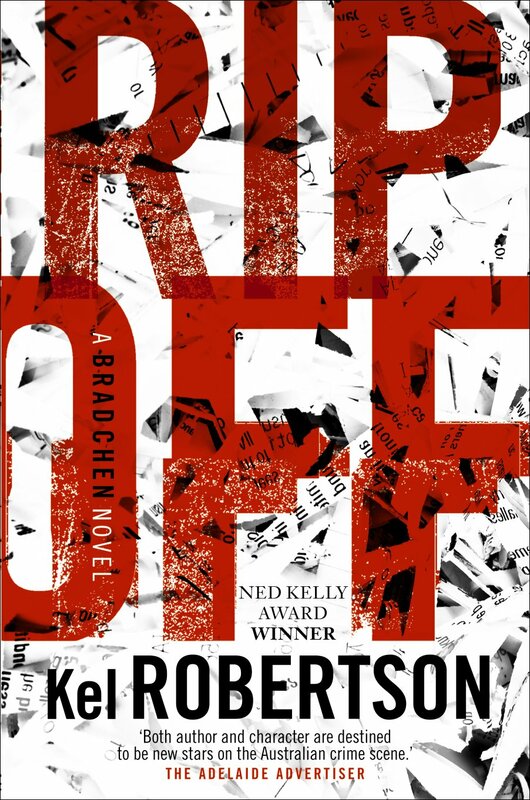 All in all I’d recommend RIP OFF widely, especially if you’re after a ripper tale, like a laugh or love to revel in the joy of a beautifully constructed sentence. The previous two novels in this series are DEAD SET and SMOKE AND MIRRORS.